One of my greatest interests in the enjoyment and production of art is the experience or encounter of that moment when the utterly profane and the truly profound meet–or even better, prove to be the very same thing. I have tried to create just such a moment in “Interior Castle,” thereby allowing that which would normally be disregarded or, more correctly, underestimated as juvenile become the portal to the most mature and significant of human experiences. The title originates in the 1577 religious treatise on prayer and meditation written by Saint Teresa of Avila. In this treatise Teresa of Avila writes of the process of approaching God through the interior life of the soul as a movement through seven stages which she describes as mansions or rooms. The movement toward God…the movement through the mansions…is a movement inward…a movement deeper into the soul of the one on the journey and, therefore, a movement of more and more profound self-knowledge which will lead to a knowledge of the Divine found at the core of individual identity. 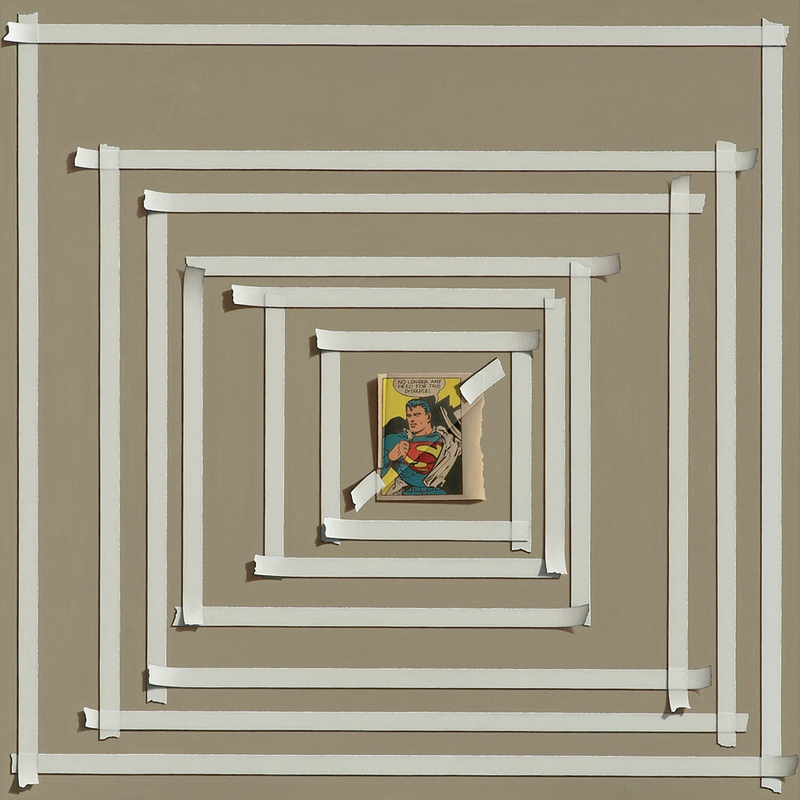 In the painting, I have created this type of inward movement by creating seven distinct background spaces each contained within the other to the point that the final taped square forms a virtual frame of very intimate proportions around the one searching…in this case Superman. He is left with no room to move so as to be forced to be with himself. I chose Superman for very specific reasons. First, I find that the mythology of ancient times…the gods and goddesses of Athens and Rome…and the mythology of medieval and Renaissance times…the saints and sinners of the Christian era…pose problems of access for the great majority of contemporary viewers due to either lack of basic familiarity or lack of resonance. So, instead, I chose from the pantheon of Pop mythology, selecting the Zeus or Christ of the Pop realm…Superman…as the means by which to tell the story. The reader, thereby, has access by the very fact that it is Superman. It just so happens that Superman inhabited a place very similar to an interior castle…a place where he could be profoundly and intimately himself…where he would not have to hide his real identity under the disguise of Clark Kent…the Fortress of Solitude. This connection brings to light the fact that, though Superman is a pulp hero crafted for the young, the psychology that resonates in his character and around him as a symbol is quite profound. Even though he is Superman…nearly invincible and blessed with an abundance of power and a correlated degree of self-confidence…his identity and all that comes with that identity like his connection to his past which forged that identity must remain hidden from public view. His greatest vulnerability is the exposure of his identity. The ultimate meaning of the painting derives from the point where the “Interior Castle” and the Fortress of Solitude meet in a conceptual sense. Every individual desires to realize the fullness of his or her identity. Reality more often than not necessitates that this realization is expressed in its fullness in the depths of our own being…apart from the view of the overwhelming majority of others. This aspiration also manifests itself in the development of social units (friendships and family and physical spaces (the home, the artist’s studio, particular sacred spaces) where perfect self-knowledge and full self-expression might be realized and all trappings and costumes might be discarded. 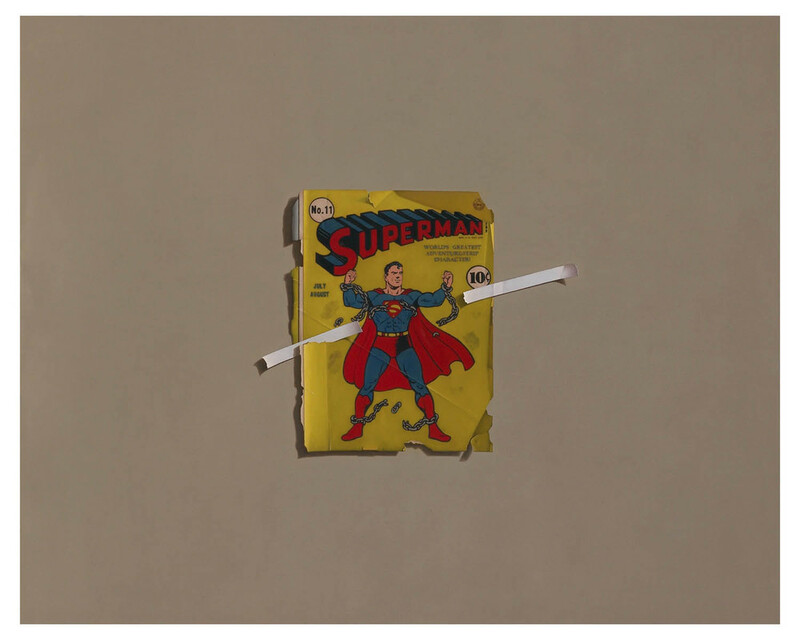 In the painting Superman represents the aspiration of every individual in contemporary popular culture to inhabit these physical and psychological spaces. Since I started fifteen years ago there have been few days when I have regretted the decision to undertake the painting life. There have been few paintings that I have regretted beginning and finishing. I have had to make no compromises and have taken no shortcuts, so I have had a certain interior pride in the work that I have completed. That said, I feel no need to have my completed paintings around me. I enjoy conceiving of them. I enjoy executing said conception. I enjoy selling the completed objects as the commercial element supports the conception and production of the next paintings. I have none of my work hanging in my house or in my studio. “Unbound,” however, is a painting that I would gladly take back into my possession. I first saw the cover image of Superman no. 11 at my local post office branch reproduced on a $0.39 self-adhesive stamp. The image made an impression on me. I am, however, not a copier of images but a painter of things. Things interest me, so I started a search into the manner by which I might acquire my own copy of Superman no. 11. The problem—that particular thing can be quite expensive. I found a copy of the original comic at an online auction for a reasonable price given that the thing itself had one of the lowest quality grades possible. The cover of the comic was wrinkled and torn, brittle, discolored and marked by the fingerprints of the individuals who had once upon a time turned its pages. I wanted the original thing itself and could afford that particular incarnation of the thing, so I purchased it. And it turned out to be the perfect thing precisely because of its myriad imperfections. When I first saw the image on the stamp I was drawn immediately to the simplicity and power of the figure of Superman rending his chains. Immediately, the similarly titled dramatic works by both Aeschylus and Shelley came to mind…Prometheus Unbound. There, before me on the cover of a 20th century comic book reproduced on a stamp towered the Pop Prometheus, the superhuman champion of post-War American culture. Again, this Pop Prometheus would stand before me as I opened the container holding an original copy of Superman no. 11. But somehow, this second encounter was different. * While the image on the cover still spoke of superhuman power, of invulnerability and strength, of idealism and perfection, the substrate upon which this image was printed…the thing itself…told another story. It told the story of its seventy plus years of existence. It told a story of vulnerability…of frailty…of imperfection and the all-too harsh narrative of reality. When taken as a whole, I felt very much that the perfection that I admired and still saw resonating on that cover in the figure of Superman had all but faded…that the idealism captured by two teenagers from Cleveland, Ohio, in creating the superhero of superheroes had all but faded away. It seemed to me that the America that had prompted the creation of such a vision and with which said vision had resonated…that America had disappeared. Superman seemed much less imposing and faintly human. In painting “Unbound” I was painting the reality of that cover…the desire for all the ideals that it embodied to exist (a song of innocence) and the realization that it no longer or never really did (a song of experience). In thinking back on this and in writing this I have come to realize that this duality exists in some sense in all my paintings, for regardless of how real I might want them to be or how real they might appear to be, the paintings are simply artful illusions. And despite knowing that they are illusions, I still want to believe in them as real and true and worth my pursuit. *It might seem silly to make the following comparison, but I am not above being thought silly in my observations. I have had a similar experience with Mondrian paintings. Their idealism and purity strike the viewer as awe-inspiring when viewed in a reproduction of some sort. The first time I saw one in person at MOMA, my experience was quite different. The perfect geometry was bisected by cracks in the paint. The crisp edges wobbled. The paintings exuded a humanity which I had gladly dismissed in the reproductions but gladly embraced while standing in front of the paintings themselves.